The creeping public-interest factor in antitrust: Still creeping or racing yet? Race to bottom: dilution of competition-law factors in South Africa? As we have reported numerous times, both on the global policy front as well as in individual case reports, the South African competition regulators and their superiors in the economic development ministry have had their sights on placing a stronger emphasis on the “public interest” element inherent in the SA competition legislation — thereby diluting pure competition-law/antitrust analysis, as some might argue. Recently, Minister Patel commended his “independent” team at the Competition Commission for not only doing a good job overall, but also in particular on the public-interest front, encouraging the systematic consideration of public interest by the Commission and the Tribunal. This kind of alignment must in future, as in the past, respect the independence of the regulator. But all our agencies, however independent, work within the framework of national policies. These remarks are fairly strong, indeed! We leave it to our AAT readership to infer the consequences of these observations on future merger enforcement and on the true degree of independence of the Commission — you can read between the lines. Over the past five years, the South African competition authorities have increasingly struggled to balance a competition test with defined public interest criteria (Metropolitan, Kansai, Walmart). Other agencies (ICASA, NERSA), and government ministries more generally, have also wrestled with how competition policy might fit into wider government policies and even broader concepts of the “public interest”, including notions of equality, fairness and access. In this paper we discuss some of key events in this ongoing debate, and we anticipate some of the battles that are likely to come. Furthermore, we set out a rigorous framework and provide a review of the available research and literature to discuss the effects of competition (both positive and negative) in multiple dimensions, in order to assess how far a “pure competition” test might go in achieving a broad range of efficiency, growth, and employment objectives. Such a comprehensive and evidence based approach is essential in understanding the costs and benefits of the existing pursuit of multiple (and often apparently conflicting) objectives, and will allow decision makers to more logically assess the trade-offs that they will continue to be confronted with. Minister Patel said the competition authority had come into their own with solid pipelines of anti-cartel investigation, the systematic consideration of public interest and issues in merger acquisition. Setting aside the unorthodox phraseology (“merger acquisition”) in the quoted paragraph, the Minister’s remarks indeed echo what we at AAT have observed for well over a year now, namely the renewed and increased focus of the competition agencies on so-called “public-interest” factors, in lieu of (or in addition to) traditional, classic antitrust considerations, such as market power, concentration/HHIs, and prediction of unilateral/coordinated effects of proposed mergers. BDLive’s Carol Paton reports that Economic Development Minister Ebrahim Patel – with whose involvement in competition policy AAT readers are well aware from reading our site – has further strengthened his grip on the country’s competition authorities. He is said to be drafting amendments to the Competition Act in relation to dominant firms’ “excessive pricing” practices. The amendments are to be introduced to Parliament in 2015. Price regulation is an absolute taboo in U.S. antitrust law, and even under more interventionist and public-policy influenced EU standards, explicit price regulation is not practiced in the bloc’s 28 member states. 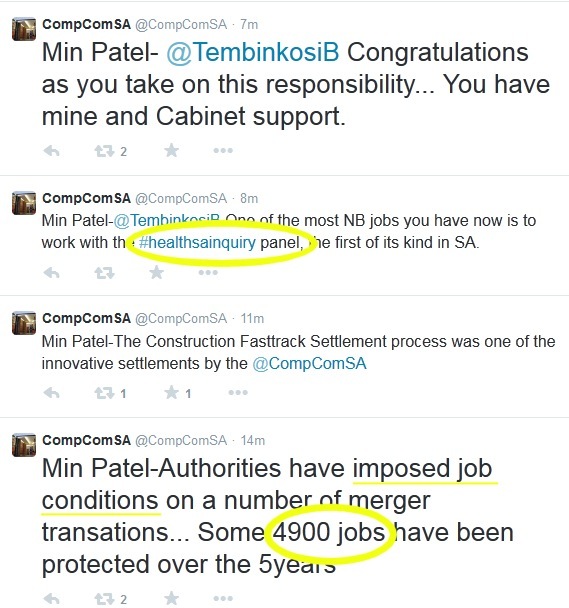 In the duo’s official tweets announcing the decision (see graphic extract below), Patel congratulated Mr. Bonakele, reaffirming his and the SA cabinet’s support of the “eminently suitable” candidate, and emphasizing the importance of (1) the Competition Commission‘s ongoing and hotly debated private health-care inquiry as well as (2) the “social-justice” elements of merger conditions imposed by the SACC on mergers in the past 5 years, purportedly “protecting” 4,900 jobs. The agency had come under considerable flak in the past year due to its high staff and executive-level turnover and a work environment that has been described as “toxic” by insiders. “I am pleased to have someone of Bonakele’s calibre at the helm of the Competition Commission. He is taking leadership of the Commission at a time when the South African economy needs to become more competitive and create many more decent work opportunities by combatting market abuse such as cartels and pervasive monopolies and ensure competitive pricing of products. In particular, the key jobs drivers identified in our policy frameworks require coordinated and concerted efforts improve economic performance and development outcomes. The agency’s official “Structure” page had not yet been updated as of the day of the announcement, listing Mr. Bonakele as “Acting” head and still showing the long-departed Ms. Makhaya as a Commission official. In what can only be described as a significant step backwards in ensuring that the more established of the emerging economies enforce the application of sound and established (e.g., ICN) best practices in relation to merger remedies, AAT has discovered that the much publicised acquisition of South Africa’s AFGRI by international private investment group AgriGroupe has recently been subjected to a private side deal between the South African Government and the merging parties, sidestepping the Commission’s jurisdiction and decision-making competence. According to its terms, Afgri is obligated to make available R90 million (US$9m, over four years) to certain South African farmers & enrol emerging farmers in development programmes and assist poultry farmers. There is little doubt that these forced conditions constitute matters best handled by the relevant antitrust regulator as proper remedies in a merger-control proceeding. At the outer limit, relevant departments such as the Department of Water, Forestry and Fisheries might have input into them. Yet, it appears that these conditions are purely negotiated by the Minister of Economic Development – the same office that sacked the prior chairman of the Competition Commission, Shan Ramburuth, and which has been subjected to criticism of meddling in the independent authority’s affairs. Following the questionable intervention of various South African Government departments in Walmart’s acquisition of Massmart (which is, as we have previously noted, the origin of the non-competition merger remedies), it appears that the same departments have in effect sought to force the merging parties into agreeing to perform services on behalf of the Government in exchange for the departments’ non-intervention before the Competition Tribunal proceedings. Heather Irvine, counsel for the merging parties, confirmed that the “merger was approved (with the agreement as a condition) after the Tribunal hearing yesterday.” She points out that “this agreement was voluntarily entered into by the merging parties in a spirit of goodwill and as a demonstration of Afgri’s commitment to growing the African food sector, not because of concerns about any public interest issues in terms of the Competition Act,” pointing to the transcript to be made available shortly. We appreciate counsel’s confirmation that the side agreement was reached entirely outside the confines of the SA Competition Act between the ministry and the parties. It is apparent that since Minister Patel has assumed his role as Minister of Economic Development (an “activist, interventionist and micromanaging minister,” according to the former Competition Tribunal chairman David Lewis), the competition authorities’ independence has been undermined (see some of our prior articles here and here). In particular, the merger process is little more than a means by which the South African Government seeks to extract from merging parties a series of additional unwarranted (industrial policy) conditions. It is in our view a highly problematic development. In sum, the S.A. merger review process remains a highly contentious issue and while the parties in this case sought to placate Government, others may not be as willing.